body. NEVER attempt to lift the victim, however, with fewer than four people. Evacuate the victim very carefully. Pelvic Fracture Fractures in the pelvic region often result from falls, heavy blows, and accidents that involve crushing. The great danger in a pelvic fracture is that the organs enclosed and protected by the pelvis may be seriously damaged when the bony structure is fractured. In particular, there is danger that the bladder will be ruptured. There is also danger of severe internal bleeding; the large blood vessels in the pelvic region may be torn or cut by fragments of the broken bone. The primary symptoms of a fractured pelvis are severe pain, shock, and loss of ability to use the lower part of the body. The victim is unable to sit or stand. If the victim is conscious, there may be a sensation of coming apart. If the bladder is injured, the victims urine may be bloody. Do not move the victim unless ABSOLUTELY necessary. 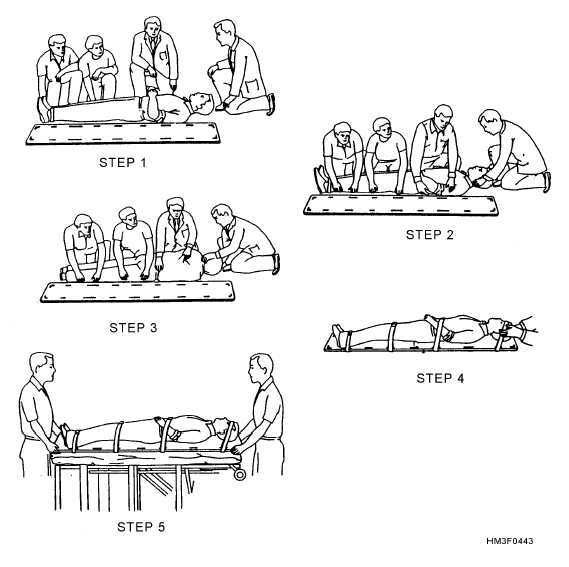 The victim should be treated for shock and 4-53 Figure 4-43.Log-roll method of moving spinal cord injury victim onto a backboard. Figure 4-42.Straddle-slide method of moving spinal cord injury victim onto a backboard.